There’s nothing like funky spelling to convince anyone reading your prose that you’re an illiterate fool not to be taken seriously. Whether you’re confronted with a letter to write, a blog posting to concoct, an article to fashion or a book to finally get around to beginning, you’ll probably want a dictionary. Paper dictionaries, aside from being somewhat Victorian in concept, are large, heavy and cumbersome to use. They’re also distracting, in that in looking up the word you’re interested in, you’re likely to become interested in other words during your search. We have a complete Oxford English Dictionary on paper – it’s fascinating, if you don’t need to get any work done. Electronic dictionaries, while lacking the resonance and air of erudition of their paper ancestors, are small, quick to use and typically updateable, should you have embraced the whole “living language” aspect of English. Most of the early examples of this technology were, however, somewhat limited. They were useful in determining whether a word was spelled correctly, but finding the correct spelling for a word was somewhat beyond their skill sets. Being built around keyboards the size of a large matchbox wasn’t an asset, either. 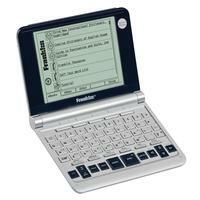 The Franklin NID-260 electronic dictionary is a lot more expensive than its less-evolved cousins, but it’s an electronic dictionary that’s genuinely useful. Resembling an extremely small netbook computer, it has a workable keyboard, a sufficiently large display, a complete etymological dictionary, a thesaurus and buckets of word search software built into it. It can even help you cheat at crossword puzzles, when you’re certain no one’s watching. The basic dictionary function of the NID-260 is diabolically simple. Enter a word into is search field. As you type, it will list words from its internal dictionary that begin with the characters you’ve entered. Once you’ve narrowed down the list to something manageable, you can scroll down to select the word you’re after. Aside from informing you how words are spelled, the NID-260 will tell you what they mean. In fairness, its definitions are a bit terse, and it hasn’t entirely supplanted our OED in this capacity. There are, however, times when it’s sufficient to appreciate what a word means without reading a complete history of its usage beginning with its origins in Old High Frisian. The Webster’s dictionary that forms the basis of the NID-260 is based on American spellings. This said, it includes Canadian and British spellings as it appears in this device. As such, it can deal with words like “colour” and “honour” – which the spell checker in the word processor I’m using to write this thinks are misspelled. The concise dictionary of English usage: Deciding when to use “whom” rather than “who,” or whether your local politician has lurched further or farther to the left can be a bit of a head-scratcher. This feature will let you select frequently contentious words and read extensive discussions about their proper application. Guide to punctuation and style: Knowing when to employ semicolons and where the apostrophe should appear in possessive nouns is another of those qualities that will differentiate you from the great unwashed. Knowing where to look these things up is almost as enlightening. Thesaurus: With about half a million entries, the Franklin Thesaurus will attempt to find words of similar meaning to whatever you enter. It’s arguably not as well-stocked as a large printed thesaurus, but it acquits itself handily if you’re not looking for a synonym for antidisestablishmentarianism. The NID-260 also offers an impressive range of diversions. It includes several games – admittedly, all of them word-related – an internal calculator, a well-stocked unit converter, a phone book and a digital clock. There’s also an extensive built-in tutorial to assist you with its many features, should you be adverse to reading manuals. The aforementioned crossword puzzle cheat feature will let you enter partial words with question marks for their missing letters – the dictionary will show you all the possible words that might solve your puzzle. The NID-260 does in fact have a USB port, and if you’d like to expand its capabilities still further, you can install its attendant Windows software and connect it to a computer. Thus empowered, it will accept downloaded ePub book documents, and become e-book reader. In fairness, this is something of a feature too far for the NID-260 – its screen isn’t hugely disposed to reading a lot of text comfortably, and the Amazon Kindle arguably has little to be concerned about in this regard. In the event that you find yourself taken with its e-book capabilities none the less, it’s worth noting that it includes an SD memory card slot to allow for all the storage you could ask for. The no-cost MobiPocket software recognizes the NID-260 as a suitable reader device, and it can be configured to synchronize a computer-based book library with the NID-260. The Windows interface to the NID-260 allows much of its internal functionality to be accessed from your PC. Robustly built, elegantly designed and oozing with information, the Franklin NID-260 is among the known universe’s nicest desk toys. It’s both quicker and more extensive than dictionary.com – even if you did figure out how to add it to your browser’s search bar – and the NID-260 doesn’t require Internet access to work. When you’ve writ your last for the day, it’s useful for looking up unusual words that turn up in whatever you read before bed. The NID-260 is powered by two AA batteries, which last for a surprisingly long time. It will also accept a five-volt wall-wart power supply, and it can be powered through its USB port. As ramparts against the shrieking of ignorance go, this is easily one of the best. Nice review! I’m so sick of ‘clever’ comments/articles/reviews that are often stupid and ignorant at once (as in ,’this really peeked my interest,’ or, ‘this begs the question’—misunderstanding its true meaning, yet not bothering to look it up). Additionally, no whining, which in itself is refreshing (Americans have it way too easy, thus depreciate seemingly everything (when is somebody going to produce an electronic dictionary in lilac?? what is this, the stone age?). Lastly, useable information, expressed well. Thanks.